We start Spring on a high! Congratulations to Tahnee who passed her NEBDN Dental Nursing exams and is now a fully qualified Dental Surgery Assistant! Tahnee joined us as a trainee dental receptionist in September 2014 and has worked her way up the career ladder, showing great commitment and determination. ‘Team John’ could not be more delighted and proud – it is a huge achievement. Tahnee thanks all at the Practice who were generous in sharing their dental knowledge and offering their support over the year. Special thanks to patients who were kind enough to allow her to initially ‘shadow’ Pauline and Debbie in the surgery; she very much appreciates all the support shown. Those patients who have visited the Practice will have noticed our ‘new look’. New blinds and turquoise-coloured carpeting internally and an unplanned change of colour to the external woodwork. ‘Oxford Blue’ happened to be paint used for the undercoat which passers-by thought ‘very smart’, mistaking this for the final coat. The feedback was so positive, that we decided to keep that colour and then update the Practice name in white. The final addition is Dr Liliya’s Ekova’s nameplate and we are very pleased to note that a year on, Liliya’s list has filled (mostly by patient recommendation) and she is now an established, busy and well-liked associate at the Practice. There is still some availability for ‘New Patient’ appointments should friends or family be in need. We can also report back on the results of our Denplan/Simply Health Professional Excel Assessment in December 2017. All very good with a result this time of 97% (we are just checking on one area relating to updates for recording of some data). The assessment is a voluntary audit which we find helps us stay focussed, up-to-date and verifies all the dental compliance for staff and patient safety that we work so hard on throughout the year. 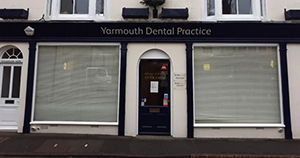 John and I are very proud; we know we have a top-class team at Yarmouth Dental Practice and we value their dental expertise and patient care. The two updates we are currently working on are Radiation (IRR17 and IRMER17) and the new General Data Protection Regulations that come into force on 25th May 2018. We are just in the process of booking to attend the BDIA Dental Showcase 2018 at the ExCel, London in October which is very much a ‘busman’s holiday’ as we meet dental suppliers and view new product demonstrations with the intention of keeping connected and current. 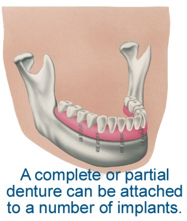 © www.dentalhealth.org – you will find useful FAQs about implants on the Dental Health Organisation website, or you can ask any member of our dental team for more information. Dr Ian Clift continues to offer a free first consultation to patients to check suitability and advise on implant or orthodontic treatments. Please ask at reception.